Max Biaggi (Aprilia Alitalia) did enough during a tough Imola race day to earn his, Aprilia's and Italy's first Riders' World Championship in WSBK. Biaggi had to work hard for his title on home soil, finishing in 11th place in race one and enduring another dramatic race to fifth that finally gave him the title. Once his only title rival, Leon Haslam (Suzuki Alstare), was forced out of race two at mid-race distance Biaggi did not need to finish to be crowned champion, but he crossed the line fifth in any case, to the roars of the 69,000 strong weekend crowd. Biaggi now has 413 points to Haslam's 350, with one round and a maximum of only 50 points remaining. Carlos Checa (Althea Racing) won both Imola races, the first after a race-long fight, the second after breaking away early. He is now only 14 points behind the injured Jonathan Rea (Hannspree Ten Kate Honda) in the fight for an eventual third place, with Rea not racing today and also not sure if he will be racing in the final round or not. Cal Crutchlow is in overall fifth, 35 points behind Checa, posting tenth and third places today. Haga's double podium today puts him one point behind Crutchlow, in sixth. James Toseland (Yamaha Sterilgarda) is seventh, but only three points up on Sylvain Guintoli (Suzuki Alstare) due to two crashes and non-finishes today. Raceday in Italy was all about Biaggi and Aprilia, but in one way the job is not quite finished, as the Manufacturers' Championship is still to be decided at the final round, with Aprilia currently 41 points ahead of Ducati. 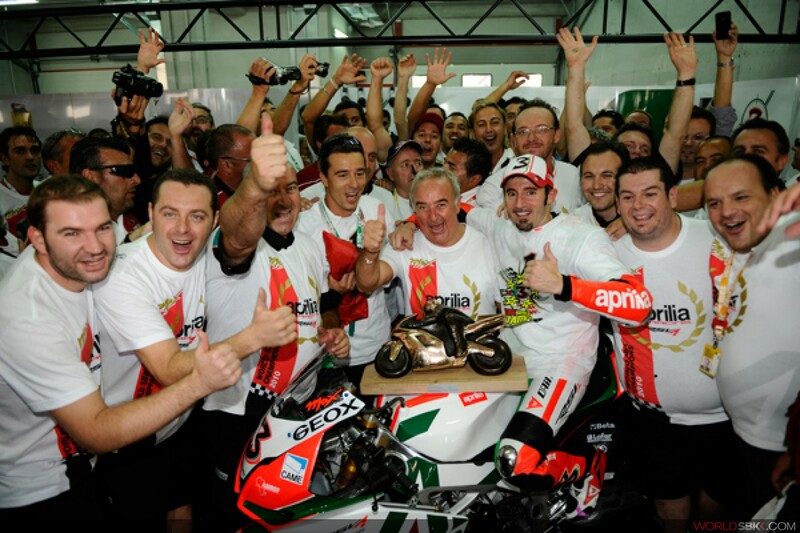 Max Biaggi: "I'm so happy, it's a big emotion through all my body. This is fantastic. It's like a dream come true, I never stopped to dream to make it happen. It was always in my mind. In fair conditions I expected it myself, OK this year we at Aprilia did a good job, there are tough riders out there, I don't want to take anything away from them, some are more consistent than others but they are all fast and this championship is very competitive. I had so many problems in race 1, off the track, on the track, the bike sideways but I didn't crash. It was very tough, for sure we didn't get the best set-up here at Imola, it's not an easy track but I never stopped to try. In race 2 we changed the bike and I attacked from the first lap. This is a really great day for me, for all my team, for Aprilia Alitalia, my sponsors, everyone who supported us to make this dream come true. We really made it happen." Carlos Checa: "Fantastic race, we struggled yesterday for qualifying in the wet but today it was more hard for the Ducatis and the top guys because it's not easy trying to pass and everyone is going fast in the beginning. I didn't want to make any mistake. Right to the very end I was pushing quite strong, at the end I didn't expect Haslam to push so strong. I saw him braking very late, but I was able to have a clean track and finish a special and nice victory. This was like a home race for the team so a big race for them." Lorenzo Lanzi: "Today was a very beautiful day for me, an Italian on the podium so fantastic. My team have worked very well this weekend, conditions were difficult, rain no rain, so it was very strange. Yesterday in Superpole I worked a lot because I wanted to finish on the podium in the race, which is important for next year. I was in the lead for a few laps, which was very good, It's been so long I don't remember what it's like! Noriyuki Haga: "It's a very good result after a really tough race, because also conditions were hard by getting hot: And I was starting from 14th on the grid. Here the first lap is very dangerous but I was looking for a good pace for the race, finally I could not catch up with Lorenzo, but I was very happy with the result. Like last year, this year I went well at Imola, the top 3 were all Ducati bikes so I am very happy." Checa was a clear race winner and new lap record holder in race two, setting a new best of 1'48.877, while Noriyuki Haga (Ducati Xerox) and Cal Crutchlow (Yamaha Sterilgarda) took podium finishes in second and third place respectively. Leon Haslam had been in a strong position to take the championship all the way to France and the final round, but when his engine let go, the championship was over there and then. Tom Sykes, for the second time, showed true competitive pace on his Kawasaki Racing Team machine, leading four laps. Carlos Checa: "It's a fantastic weekend, I can't remember one like that. It was a very good job by the team. Yesterday I was struggling on the wet, but today they were two exciting races, more the first than the second. But the second I could see that I could win, I just had to keep my concentration. Anyway it was fantastic, for all my team, for Ducati, for everyone here, congratulations to Max for the title and a shame for Leon Haslam." Noriyuki Haga: "I am very happy today, and the bike was much better than in the first race. I was approaching Carlos in the last laps but couldn't catch him. Now I try my best at Magny-Cours to improve my position." Cal Crutchlow: "After a tough race 1 for me, to come from 12th on the grid with such close racing this weekend and such a depth of field was a very good result. I really had to work for it so all credit to Yamaha Sterilgarda, they did a good job for me especially in the second race. We made a few changes in the meantime, it was a bit of a gamble but a good job all round."